At the age of ten, when my best friend asked me why I still ate animals if I loved them so much, I promptly became a vegetarian. It’s a strange trajectory to go from refusing dissection at age ten to being a vivisector at age twenty-three. Societal norms are incredibly powerful forces, and are often used to erode the values and ethics we hold as children; but we can harness these forces for good and create a culture where justice and nonviolence are the norm. We can create an expansive network of people who proudly proclaim that all animals are equal. I’ve been meaning to write this post for a while— partly to share my story and partly in the (likely false) hope that it will alleviate some of the guilt I feel about this period in my life. Reading Kirstine’s post about her experiences as the daughter of a dairy farmer and re-watching Maximum Tolerated Dose has helped this finally come to fruition. Growing up, I loved animals. I begged for a dog every birthday and Christmas, and had a monthly column in the SPCA newsletter about my various animal friends. Animals were in all of the books I read and all of the games I played. At the age of ten, when my best friend asked me why I still ate animals if I loved them so much, I promptly became a vegetarian. That year, in Grade Four, our class dissected a salmon as part of a project. My friend and I sat in the hallway in protest, crying. Over the next thirteen years, vegetarianism became more and more of a habit, and less and less of an ethical stance. I don’t know if it was that I stopped caring, that I didn’t want to make a “scene,” or if it was something else entirely; but my days of standing up for animals were mostly gone. I continued to abstain from eating their flesh, but I became perfectly content with dissecting it. In high school, I did it all: frog, cow’s eye, cow’s lung, various invertebrates, and even a fetal pig. I studied Biomedical Physiology and Kinesiology as an undergraduate. As part of an anatomy course, I spent an entire semester dissecting a rabbit. I named her and spent hours with her each week, but neither talked nor thought about where she came from, what life she had lived, or the purpose of the exercise---considering that each dissection was complete with numerous annotations about how human anatomy differed. Animal liberationist Almira Tanner working at a vivisection lab, years ago. In my last semester, I took a fascinating class about implantable neural interfaces and the rehabilitation of movement control. I had recently decided I didn’t want to move forward with my plan of becoming a physiotherapist, so I jumped on the opportunity to complete a Master’s and possibly a PhD thesis with the professor in his lab. We would be designing a biomedical device that could save lives, reduce hospital stays, and save the healthcare system millions of dollars. Within the first few weeks in the lab, it became clear that I was going to be a vivisector. I don’t know if I really was so naïve as to think that I could do this work in the current academic culture without doing vivisection, or if I just forced myself to not think about it when I agreed to take the position. Either way, there I was, standing in a pseudo-operating room with an anesthetized female pig on the table, ready to be sliced open. I remember the research facility vividly. I remember waiting to be let in at the entrance with my ID. I remember the lunchroom covered with posters of the technologies and cures we wouldn’t have without animal experimentation… And I remember the pigs. We never saw the pigs when they were conscious. They were brought in (from where, I don’t know), anesthetized and prepped before we got there, and we were gone before they ever woke up. The lab technicians would tell us how they did between experiments: if they thought they were in pain, how they handled the techniques, if they were developing an infection; but we never saw them awake. The worst came when were done with an individual pig. I remember asking why we couldn’t let them live, considering our research did not require them to be murdered. I was told that they were “purpose-bred,” we needed a few tissue samples, and no one would want them anyway—so what was the point of letting them live? When the team physician administered the drug that ended the pig’s life, the lab technician brought us a garbage can. The table was tilted, the pig was slid into the can, and she was taken downstairs. She was literally garbage. There was a sort of hazing in the lab where the newest member would have to take the body down to the basement. The team exempted me because I was a vegetarian. I was relieved. I spent six months in the program and then quit. It was probably the most miserable time of my life. I didn’t realize how distraught I was until my mom innocently asked me how things were going into the lab and I burst into tears. I found myself unable to stop crying. That was almost five years ago; but the lab still haunts me. 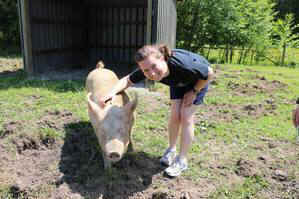 Almira with Lucy, a rescued pig, at The Happy Herd sanctuary. Reflecting on my experience, I realize that even when I was in the thick of it all, I was so distanced from what was actually happening; similar to the case at a slaughterhouse, as described by Timothy Pachirat in his book, Every Twelve Seconds, separation was everywhere. I did not know the pigs: where they came from, how they grew up, or what they were like when they were conscious. I alleviated my guilt by not having to see where they ended up when we killed them, as if that made what I was doing more ethically acceptable. My relief of not having to go down to the basement meant nothing to those pigs. On the other hand, the lab technicians who did know them barely saw them during the experimentation and were not the ones to administer the final lethal dose. In the end, it felt like no one was really responsible. It was just something we did, something that “had” to be done, for the good of science and humankind. In case we ever forgot this, the posters lining the facility would remind us. Almira now speaks out for pigs and other animals. It’s a strange trajectory to go from refusing dissection at age ten to being a vivisector at age twenty-three. Societal norms are incredibly powerful forces, and are often used to erode the values and ethics we hold as children; but we can harness these forces for good and create a culture where justice and nonviolence are the norm. 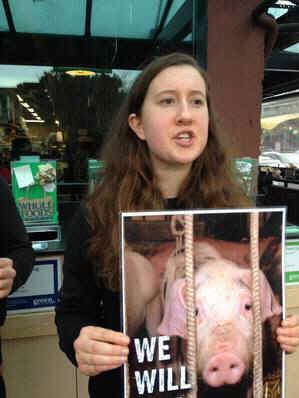 We can create an expansive network of people who proudly proclaim that all animals are equal. We can move forward from our past and dedicate our lives to advocating for those who are suffering. For the pigs and the rest of the millions of animal who are exploited each year in the name of Science. These are my initial thoughts on my experiences as a vivisector. 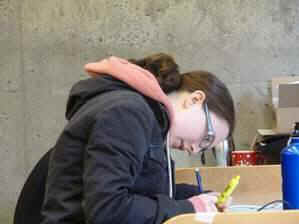 I anticipate that I will continue to reflect and write about this time in my life.